During the First World War Crossley had been fully occupied making 20/25 based vehicles principally for the Royal Flying Corps (RFC) and its successor from April 1917 the Royal Air Force. These were mainly bodied as tenders, staff cars and ambulances. Many of these, particularly the tenders, were to remain in service throughout the 1920s. For example, some 400 were transferred to the new Irish Army on the creation of the Irish Free Sate in 1922. With peace, production at the factory returned principally to car making but there was a major side line in refurbishing ex military vehicles, mainly at the now Crossley owned AVRO works, and these continued to be advertised into the early 1920s. In fact delays in running down government orders meant that new 25/30 tenders for which there was no requirement were still being supplied well into 1919 and were straight away added to those to be disposed of. To give some idea of the scale of this operation, at the armistice the RAF had over 23,000 vehicles (not all Crossleys) on its strength and whilst those in the more far flung theatres of war were disposed of locally most of those on the Western Front returned to the United Kingdom. Surplus vehicles, many brand new, were frequently lined up two abreast down the sides of suburban roads. Described more fully in the Commercial Vehicles section there came in 1923 a significant order from home ground for the development of the 15 cwt 4 wheel British Government Tender BGT chassis (also known as the 40-50hp) followed in 1926 by a 30 cwt 6 wheel, 3 axle version, the British Government Vehicle BGV with the 2.4 litre engine from the 14hp car. This was also made with the rear two axles replaced with the Kegresse rubber track system. Both of these chassis would find uses under a variety of military applications. In 1928 the BGV chassis was modified and the designation changed to BGV2. The BGV however was found to be underpowered and a new chassis with 3.7 litre engine was announced in 1929 and became the BGV3 with BGV4 and 5 variants. Deliveries continued until 1935. Also in 1923 the Government of India issued a specification for a basic 30cwt vehicle. To meet this the 25/30 type engine was mounted into a chassis that had been designed for an order from the Russian government that never materialised because of the Revolution. This truck was designated the IGL (Indian Government Lorry). Total deliveries of the IGL1 were about 450. All of these were fitted with solid tyres presumably to remove the risk of punctures. The British Army in India had a requirement for Armoured Cars for areas such as the North West frontier. A delegation was despatched to Britain to see what was on offer and particularly to look at the offerings from Rolls-Royce as their wartime models had performed well. As well as being expensive they surprisingly were unable to get over the gradient test on the cross country trial. Also at the trials was a Crossley IGL This was the chassis that was under consideration as a medium truck for India and eventually became the IGL1 (Indian Government Lorry). It sailed through the trials and one was immediately purchased for an extended trial which consisted of loading it with 4 tons of ballast and driving 4000 miles round Britain. An order for 32 followed with bodies by Vickers and these were designated IGA1 by Crossley. These were delivered in 1923 and a further order followed. The IGL had solid tyres but these were never very successful when used off road as their narrow profile inevitably led to the vehicle sinking up to its axles. Two of the armoured cars were also shipped to South Africa where the tyres also caused trouble and were eventually changed to pneumatic types. Both of these survive and are in the South African War Museum. A batch was sold to Japan and six to Argentina. Further export orders for two batches of 4 wheel chassis for armoured cars came in 1925 and 1927 from the Estonia Defence Force. The superstructure for this was designed and built in Estonia with 7mm armour plate from Sweden. Two versions of the car, which was designated M1927/28, were built, seven with 7.7 mm machine guns and six with 37mm Hotchkiss SA guns. A crew of 4 men was carried. The vehicles weighed 4.8 tons and had a maximum speed of 60 kph. The Royal Army Service Corps had designed and patented a twin axle articulating bogie with all wheels driven and this was used in Crossley's offering to meet the 1925 requirement for a medium general service vehicle. The IGL chassis was lengthened to become a six wheeler rated at 3 ton capacity (2 tons over soft ground) and was manufactured in 1926 and 1927 as the IGL2. The IGL2 was further upgraded to 4 tons in 1928 to become the IGL3 available as either forward or normal control and fitted with the 30/70 petrol engine. In 1927 Crossley were briefly involved with the Tankette. These were small armoured vehicles usually armed with a machine gun and crewed by one or two men. They were intended for close support of infantry troops. The chassis used was the 3 axle BGV with Kegresse rubber tracks on the driven four wheels. Unusually the vehicle was designed to run in the reverse direction from normal so the tracks were in front and steering on the rear axle. The one man crew compartment was over the tracks. It was said to ride well but the tracks threw dust into the engine resulting in rapid wear. Only two prototypes were made. 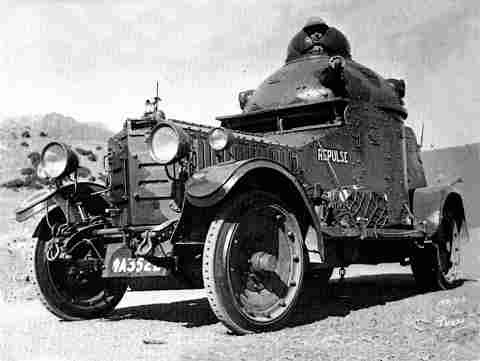 The BGV was in 1929 used as the chassis for another of Crossley's armoured cars. Two prototypes were ordered by the Army with superstructure built by the Royal Ordnance Factory. 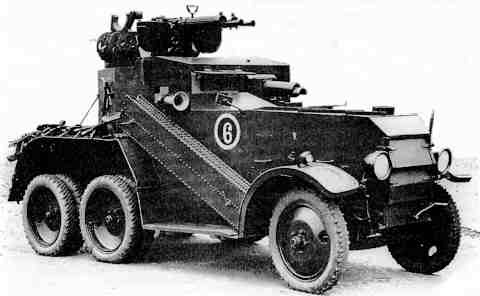 The first to specification D2E1 was armed with a .303 machine gun and operated by a crew of three. Special wrap round tracks were supplied that could be fitted round the wheels on the two rear axles to make them into a type of half track for rough terrain. Both the rear axles were fitted with twin tyred wheels. In 1931 the prototype was sent to Egypt for desert testing but it was not a success. On its return it was fitted with a new turret mounting two 0.5 machine guns for anti-aircraft use. The second prototype to spec D2E2 was built in 1931 and included a lower bonnet to improve the drivers view and improved armour. Eventually an order for five vehicles was received and they were built with the D2E2 chassis below an anti aircraft turret and designated by the War Office the Crossley Mk 1. In spite of the previous reservations they were in 1933 sent to Egypt where again they were found to be not a good vehicle in the desert. The RAF also ordered three 6 wheel armoured cars in 1930 based on the IGL chassis in for use in Aden. These were designated IGA3 by Crossley. Two were fitted with dome turrets carrying twin Vickers machine guns and the third, larger, vehicle carrying a tank type turret with single gun and machine gun below next to the driver. All three were fitted with wireless sets. A series of similar vehicles were also supplied to the Iraq government. From the mid 1930s re-armament of the British forces started and Crossley again became heavily involved with supplying both its previous major customer the Royal Air Force and also the British army. 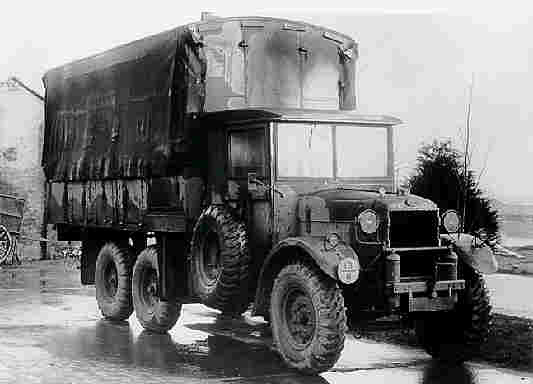 The orders were mainly satisfied by the IGL3 truck which had been supplied since 1928. The IGL would go through a series of further versions designated IGL4, 6 ,7 and 8 for the army. The RAF versions were all normal control and all called IGL3. In 1935 a new War Office specification was issued for a medium 3 ton 4 x 4 truck that was to replace the 6 x 4 IGL type and in 1938 an order for a prototype was placed. This vehicle was of an advanced design with independent suspension, the new 38/110 bus engine and a 5 speed gearbox. It performed well but in the end because of pressures to get production underway and a requirement for ease of repair the War Office requested a simpler vehicle. 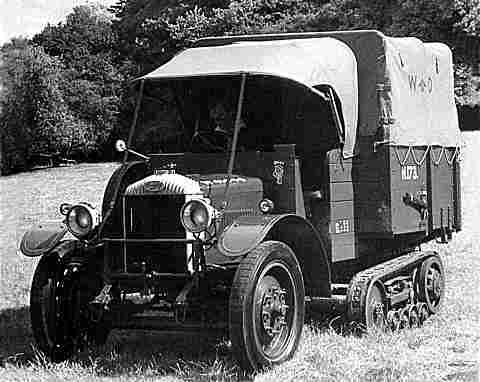 1935/6 Crossley IGL3 3-ton with 90bhp 30/70 5,266cc petrol engine and 4+2 gearbox fitted with an RAF general service truck body and photographed in France during World War II. The final design, known as the FWD or Four Wheel Drive, had an 11 foot wheelbase and used a conventional suspension, the drive train of the 2 axle IGL and the proven 30/70 engine. The name often used for these, the Quad or "Q" type, is not strictly correct as "Q" was the specification title used by the War Office and so could be applied to vehicles from several manufacturers of differing designs. Just after the outbreak of war in 1939 production of the FWD started in earnest with initial orders for 506 trucks and 228 crash tenders, and a further 700 vehicles after the British Expeditionary Force lost most of its equipment in the 1940 retreat to Dunkirk. First deliveries were in July 1940 and nearly 800 were delivered by the end of the year along with 340 IGL's. In 1943 a tractor variant entered production and a more powerful 96bhp (later 100bhp) engine, the 30/100, available as an option. Three variants in all were produced known as Types 1, 2 and 3 with differences in transmissions and engines. Between 1939 and 1945 7406 and 2836 tractors left the factory, deliveries peaking at 200 a month. The cabs were mainly built by Crossley but Mulliners built over 2800. Bodies were built by many makers including Park Royal and English Electric and included wireless vehicles, breakdown trucks, mobile cranes, crash tenders, mobile generators and command posts. They were famously used with a "Queen Mary" trailer by the RAF for aircraft transport and recovery. The FWD was Crossley Motors largest ever production run exceeding even the World War I RFC, given the conditions and the cramped factories a remarkable performance. As an aside to vehicle production Crossley had hoped to reproduce their World War 1 aircraft success. In 1936 the Erwood Park factory was offered to the government as an aircraft factory and the purchase went through in 1938 to become Shadow Aircraft Factory No 6. However the team chosen to manage it was Fairey Aviation who owned the adjacent plant they had bought from Willys Overland Crossley in 1934. 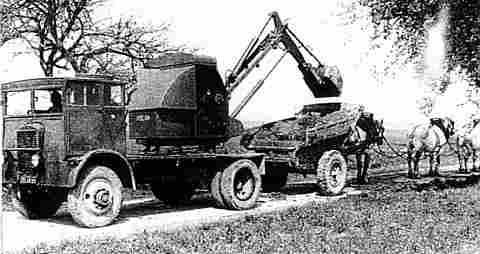 A Poclain crane mounted on an RAF FWD demonstrating ditch digging in France. Crossley's final military contract came in the 1950s with the British army requirement for a new armoured car to replace the war time AEC Mk 3 and Daimler Mk 2. This was designated Saladin and was equipped with a new 76 mm gun to replace the existing 2 pounders. Alvis were at the time developing the Saracen armoured personnel carrier and this chassis was adapted to become the basis of the Saladin armoured car. Because of the emergency in Malaya the production of the Saracen took precedence over developing the Saladin and as the Alvis factory was fully occupied the first six pre-production Saladins were built in 1956 by Crossley Motors. Production began two years later at the Alvis factory in Coventry.